M9D We Are Salt Because God is El Elyon | GOD Who Are You? AND Who Am I? We need to look at salt before we can fully understand what it means to be the salt of the earth for our own purposes. So, what is it? What does it do? How can we use that knowledge to be better “salters” of the earth? Salt is a chemical with the formula NaCl, or sodium chloride. Salt’s chemical structure is a cube with depth, width, breadth and height. This four-sided crystal shares biblical significance with the earth. The “four corners of the earth, the four winds of the earth” (see Rev. 7:1), four regions (north, south, east and west), and the four seasons (fall, winter, spring and summer) are all biblically significant. The number four is also the biblical number which means “creation”—God Most High, Creator of heaven and earth (see Gen. 14:19-20). Salt is in crystalline form, transparent like glass, but before refinement, comes in rock form—discolored and misshapen. The physical, chemical truth is that salt cannot lose its saltiness without sodium chloride changing its physical structure (and actually becoming something else entirely). Therefore, what can it mean when Scripture says, “if salt loses its saltiness?” Mark 9:50 sheds light on the subject. It records, “Have salt in yourselves . . . .” The only thing in heaven and earth that does not change is Jesus himself, the Word made flesh, “Jesus Christ is the same yesterday and today and forever” (Heb. 13:8) and does “not change like shifting shadows” (James 1:17). Therefore, salt is Christ—the Word of God. Dwight discovered it was God’s Word that pierced the heart, and until he put it to use he knew nothing about being the salt of the earth. He had to be refined before he was transparent so Jesus could be seen in his life—no longer misshapen. It was the Word which gave him depth as it transformed his life in all four dimensions—physically, spiritually, mentally and emotionally. Salt preserves foods and is used as a de-icer for roads and highways, but loses its melting ability in extreme cold conditions. Salt softens hard water, making everything it touches more effective. It has healing qualities, disinfects wounds, and is used in spas for treatment of the skin. Salt was used as a cleansing agent in medieval times. Ezekiel 16:4 tells about newborns being rubbed with salt. Salt is used as a seasoning. Job said, “Is tasteless food eaten without salt, or is there flavor in the white of an egg? I refuse to touch it; such food makes me ill (6:6).” Salt is good, although the body needs only one teaspoon (6 grams) per day, of which three-fourths comes naturally from prepared foods. Too much salt kills. 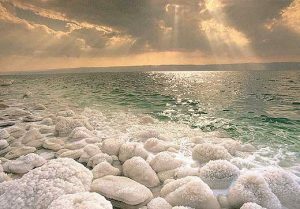 The Dead Sea (Salt Sea) in Israel is 30% salt, nearly ten times the amount of normal sea water. No fish can live in it nor anything on the land surrounding it. Dwight learned the Word was salt seed he must be ready to plant in the right way. He witnessed that only the Holy Spirit could make it grow—water it and bring the increase—at just the right time God was working with a heart to receive—before it became so cold it could not. Salt is good, but it must be kept in balance. The body will not function properly unless the ratio of salt to water in the bloodstream remains near constant. Every living cell in the body is bathed in a salt solution. The first intravenous solution given to a hospital patient is saline, or salt water. Salt is critical to life; lack of it causes death, yet the kidneys filter out and eliminate any minor excess. Similarly, when salt intake is too low, the kidneys make every effort to retain all they can. Carol J. S. is an excellent example of a Christian—having salt “in season and out of season” (see 2 Tim. 4:2). Plus, she learned the importance of balance. Carol was saved at a young age and baptized in her church. She grew up in the best of best of Christian homes and never heard a cuss word from her father or fighting from her parents. Still, she had to overcome feelings of not measuring up to siblings and learned to make her parents’ faith her own. Growing up learning the Word through a mission’s organization named Girl’s Auxiliary planted her in a salty foundation. One day when she was twelve a missionary spoke at her church. Listening to him called forth a longing to be used by God for this same purpose, “Yes, I will do that!” Without a doubt she knew this was her destiny—but “life” happened. Carol fell in love at age sixteen, married at eighteen, and had four children. Many times she thought about her heart decision to go wherever God wanted her to go. Why had it not happened? When her daughter came home from youth camp and said, “I’m going to go to Venezuela!” God’s fulfilling my dream through my children, she thought. “No, Mom, you are supposed to go, too.” Carol decided to test the door; it opened; she was chosen to go, which was unusual since it was a teenaged team by design. She and her husband began to pursue short-term mission trips, taking their children with them. An opportunity arrived for the couple to go to Nepal and Thailand with a medical mission team. With no medical training Carol played nurse, watched surgeries, and helped pray for three days for 900 people before their surgery. “We are holding a national Christian conference for teachers and pastors in another town. The lady who was to speak to the women cannot get through on the roads. Can you come speak?” asked the sponsoring missionary. Carol agreed. That night, she prepared a talk for these women. She had no notes or books to reference. All were back in the states where she had been preparing for a women’s retreat about the life of Queen Esther. This was the message already in her heart. The next day as Carol viewed the Nepalese women, they were looking in their laps— having been taught not to have eye contact, especially with men. Speaking through an interpreter, the main words Carol kept repeating were, “You are the King’s daughters!” Slowly their heads began to rise as she talked. She witnessed their growing smiles and increased excitement as they became receptive to the Lord. After the conference Carol learned Nepal was ruled by a king. They had more information than she did and God used the salty Word in her heart to bless real, hurting women in a dark place on this earth—a fulfillment of a prophecy spoken to her years before. Epiphany Software\Bible, Explorer 3 (accessed April 7, 2007). http://www.siftocanada.com/saltbook/yourbody.htm (accessed April 8, 2007).